ANOTHER new model from Harley-Davidson, as we predicted a couple of days ago, is the Softail Slim. The recipe seems to be 'Take one Fat Boy and put it on a diet' – but the result is a refreshingly purposeful-looking, chrome-free retro. 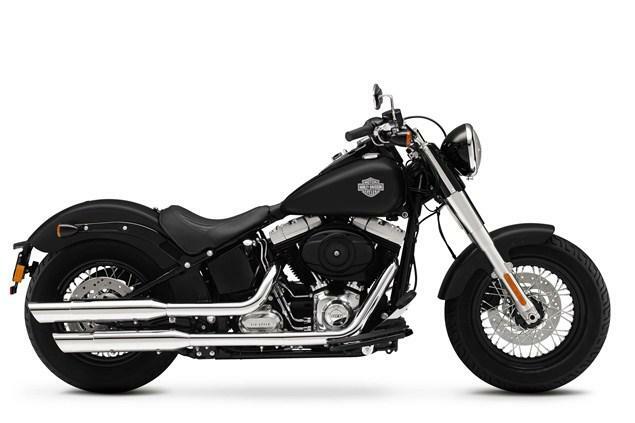 Pare down a Harley-Davidson® Softail® motorcycle to its essential elements and you have the Slim. From its trimmed front fender to its narrow rear end, Slim is a no-nonsense, back-to-basics motorcycle. Call it stripped. Call it old school. Call it lean and mean. What's left is the elemental Softail profile and iconic Harley-Davidson® style that recalls classic custom bobbers of the 1950s. "It's time to make the engine the focal point of the motorcycle," says Harley-Davidson Senior Designer Casey Ketterhagen, "so we put a Softail on a diet to get the proportions back in check. Scale down the rear with a narrow tire and chopped fender and the heart of the bike, the motor, once again becomes the focus. We left a gap between the nose of the seat and tank so the rider can see the top of the motor. I like to be able to look down and see what's moving me." To keep the rear of the motorcycle simple and clean, the Slim has combination stop/turn/tail lights and a side-mounted license plate. The rear fender struts are left uncovered, exposing the forged steel and fasteners. A thin formed-leather strap covers the fuel tank seam. The powertrain is finished with polished covers instead of chrome, and the black cylinders are left unhighlighted. The FL front fender is trimmed to expose more of the tire. "I'd personally like to strip the bike down even further," says Ketterhagen, "but this is as far as we can go on a production model. The Slim is intended to be a direct interpretation of home-built customs of the 1940s and 50s, and we used a number of components that evoke that era, beginning with a Hollywood handlebar." The Hollywood bar, identified by its wide bend and cross brace, was originally an accessory for Harley-Davidson® models with a Springer fork. The name may have been coined because owners of that era who used the cross-brace to mount lights and bags had "gone Hollywood" with excessive accessorization. For the Slim, the cross-braced bar and louvered headlight nacelle are finished in gloss black. 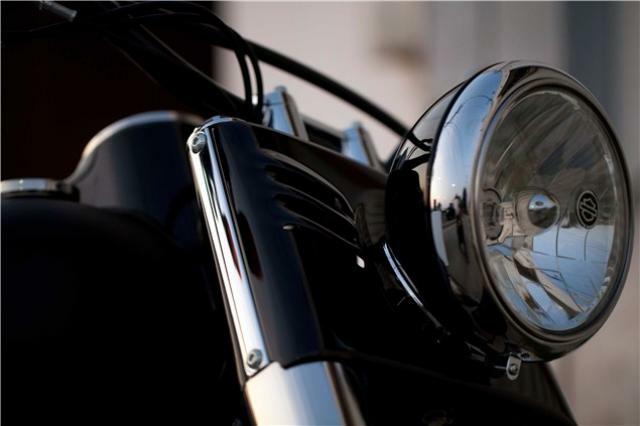 Other period styling cues include a gloss black "cat's eye" tank console with a retro speedometer face, half-moon rider footboards, a round air cleaner cover, and gloss black wheel rims and hubs. 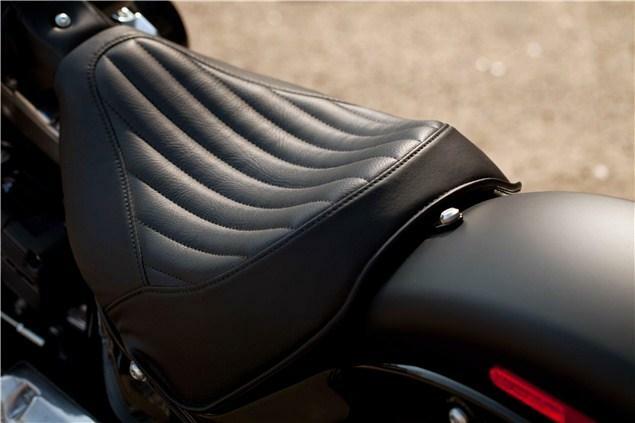 The cover of the solo seat is stitched in a tuck-and-roll pattern. "The seat really gives you the feeling of sitting in the bike, rather than on it," says Ketterhagen. "The bars are nice and low, too, so when you're riding you have an unobstructed view forward, which reinforces the idea that this is a very elemental motorcycle, a real back-to-basics ride." A counter-balanced Twin Cam 103B™ engine is rigid-mounted within the frame, creating a solid connection between rider and the machine. 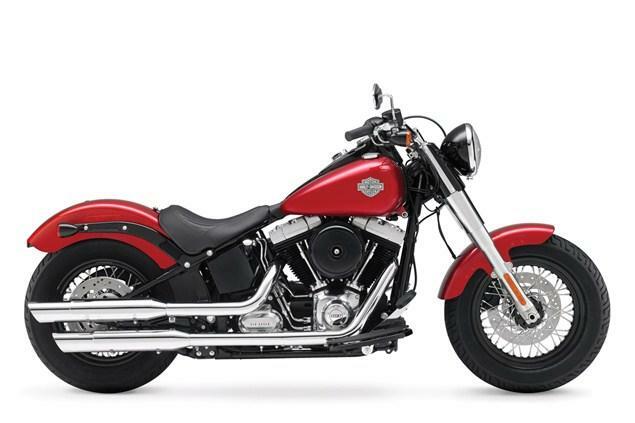 The Softail® chassis mimics the clean lines of a vintage hardtail frame, but utilizes rear suspension control provided by coil-over shock absorbers mounted horizontally and out of sight within the frame rails. With the combination of a 23.8-inch seat height and rider footboards, the Slim comfortably fits a wide range of riders and offers light side-stand lift-off. 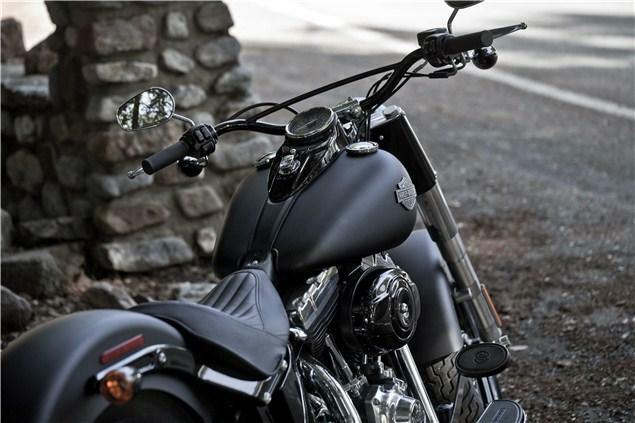 A pull-back riser from Harley-Davidson® Genuine Motor Accessories can be installed to move the handlebar back two inches without changing control cables and lines. Rigid-mounted, air-cooled, 1690 cc Twin Cam 103B™ counter-balanced engine with Automatic Compression Release (ACR) rated at 98.7 ft. lbs. peak torque at 3000 rpm. Powertrain is finished in Black powdercoat with polished covers. Chrome, over/under shotgun exhaust with slash-cut mufflers. Gloss Black round air cleaner cover. 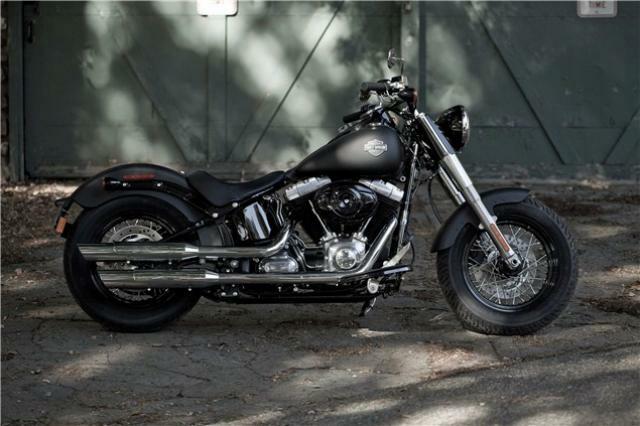 Classic 5.0-gallon Fat Bob® fuel tank. Black "cat's eye" console holds electronic speedometer with retro-style face. Dunlop® 16-inch (MT90B16) front and rear (MU85B16) tires. Gloss black headlamp with chrome trim ring. Gloss black nacelle with punched louvers. Half-moon footboards with retro-style foot control pads. Chopped rear fender exposes rear tire. Solo seat with black tuck-and-roll vinyl cover. Forged rear fender supports are finished in Gloss Black powdercoat. Gloss black "horseshoe" oil tank. Paint color choices include Vivid Black, Black Denim, and Ember Red Sunglo.